134 backers pledged $9,838 to help bring this project to life. We just received in from the sculptor a Spawn of Yog and 2 new Spawn of Cthulhu. All 3 of these are 20mm high. You can add any one of them to your KickStarter for a $4 increase to your pledge. For $11 you can add all 3. We also have an Avatar of Shub that will be cast up. He's a big guy at around 40mm to his shoulders. You can add him to any pledge level for $12. Want to get all 4 added to your pledge level ... just increase your pledge by $20 and we'll add all 4 to your pledge. 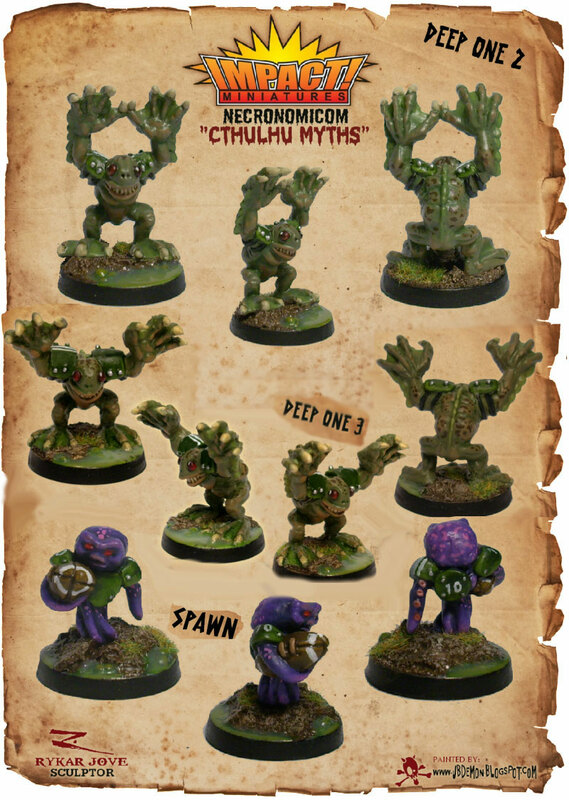 In addition with the addition of one big guy and 3 little guys ... for you fantasy football gamers out there we added a $100 level for you to have a 14 figure Cthulhu Ogre team. 2 of each of the 4 Spawn figures (Yog + the 3 Cthulhu Spawn (one was previous offered in Stretch Reward #1)) and one each of these 6 big different big guys: Yog-Sothoth, Shub-Niggurath, Elder Thing, Dagon, Avatar of Yog and Avatar of Shub. Impact! Miniatures has traditionally produced fantasy sports miniatures and we are looking to widen our range. We also have a program to help amateur sculptors build a portfolio, have their works produced and receive payments based upon how successful their miniatures sell. When we were approached by a talented, amateur sculptor from Spain with these miniatures we knew we had to work to get them produced and into the community's hands! The cost of producing a full range, rather than just a miniature or two here and there, is daunting and so we've come the community looking for some help. We're seeking some capital to help defer the costs of master moulding, production moulding and having them cast up. If these are successful, the sculptor has 15 MORE miniatures he'd like to make including Hydra, Cthonian, Mi-Go, Azathoth, Tsathoggua, Yig, Yith and more! Stretch Reward #2 is that everyone pledging $100 or more will receive 3 FREE miniatures of their choice from either Group #1 or the Stretch Goal #1 Group and will recieve a set of 2 of the Cthulhu dice (your choice of the 4 colors). This stretch goal represents the actual cost for us to have this line of figures made so if we reach this goal we really want to give everyone some free items to thank you for your support! STRETCH REWARD #1 - $6000 - REACHED! Stretch Reward #1 is a free miniature from the Stretch Goal #1 Group to everyone who has pledged $100 or more. Gemini Black-Green w/gold (top left); Gemini Green-Purple w/gold (top right); Gemini Gold-Green w/white (bottom left); Vortex Green w/gold (bottom right). You can add $4 to your pledge to get 2 dice of your choice. After looking at the various sizes of the miniatures we decided to offer them in four "bands" which are based on cost of production and future MSRP. These costs include the weight of the metal and the number of pieces the miniature is made of. We also added two other reward levels for those that would like the package set of HP Lovecraft and Cthulhu and for backers that would just like one of each miniature. All reward levels include the price of worldwide shipping. For example, if you want one miniature from Group #2 and Group #4, you would pledge $30 at either the OUTER THINGS or GREAT OLD ONES level. As another example, assume you want one miniature from Group #1, two from Group #3 and one from Group #4. You would pledge $51 at any of the three levels that includes one the figures you want (for example at the OUTER THINGS it would be the $16 level + $5 for Group #1 + $12 for an extra Group #2 figure + $18 for the Group #4 level). Deep One #2; Deep One #3 and the Spawn. NOTE: these 3 figures are not inlcuded in the $125 DEVOTED CULTIST level. Cultist - Roughly 30mm to the eyes. Multiple pieces. 0.96 oz weight. Nyarlathotep - Roughly 40mm to shoulders, 0.92 oz weight. 2 Versions... with & without football. Multiple pieces. "And where Nyarlathotep went, rest vanished; for the small hours were rent with the screams of a nightmare." Avatar of Yog - Roughly 35mm to the shoulders, 1.66 oz weight. Elder Thing - Roughly 35mm to shoulders (foot has been repaired), 1.84 oz weight. Multiple pieces. Hastur with Chainsaw - Roughly 30mm to shoulders, 1.87 oz weight. Multiple pieces. The King in Yellow in an avatar of Hastur. Yog-Sothoth - roughly 35mm to the shoulders, 2.0 oz weight. Multiple pieces. He also has 2 optional eye stalks. “Yog-Sothoth knows the gate. Yog-Sothoth is the gate. Yog-Sothoth is the key and guardian of the gate. Past, present, future, all are one in Yog-Sothoth. He knows where the Old Ones broke through of old, and where They shall break through again. He knows where They have trod earth’s fields, and where They still tread them, and why no one can behold Them as They tread. A thousand eyes... Trapped forever!" Shub-Niggurath - roughly 40mm to the shoulders, 2.67 oz weight. She is a perverse fertility deity said to appear as an enormous cloudy mass which extrudes black tentacles, slime-dripping mouths, and short, writhing goat legs. Small creatures are spat forth, which are either reconsumed into the miasmatic form or escape to some monstrous life elsewhere. All miniatures are cast in lead-free pewter (white metal) and are unpainted. MSRP of the complete set is expected to be around $175 with shipping once publicly available. LESSER BEINGS - You can choose one of HP Lovecraft, Deep One, Shark-Man #1 or Shark-Man #2. Shipping (domestic or international) included with this level. OUTER THINGS - You can choose one of the Cultist, Proto-Shoggoth, Nyarlathotep with football and Nyarlathotep without football. Shipping (domestic or international) is included with this level. ELDER THINGS - You can choose one of the Elder Thing, Avatar of Yog, Hastur w/Chainsaw and Yog-Sothoth. Shipping (domestic or international) is included with this level. GREAT OLD ONES - You can choose between one of Cthulhu, Dagon, and Shub-Niggurath. Shipping (domestic or international) is included with this level. CREATER AND CREATION: One HP Lovecraft and one Cthulhu miniature. Shipping (domestic or international) is included with this level. DEVOTED CULTIST: One copy of each of the 15 miniatures in the set! Shipping is included (domestic or international) with this level.